This is an overview to the hanamachis in Kyoto (Pontocho, Kamishichiken, Miyagawacho, Gion Kobu and Gion Higashi) and Tokyo (Shimbashi, Akasaka, Asakusa and Yanagibashi). There is also a small section titled Regional hanamachi. Some of the arts of the geisha are also introduced to the reader in this chapter. Each hanamachi is introduced separately with their history and modern day image. History section starting from the saburuko up to the 1959. This section of the book overlooks geishas career from recruited shikomi to independant geisha. Each state of career has it's own little section for closer examination. In the end of the chapter there is a small section of the taikomochi tradition. The previous chapter was an overlook of the career of a geisha, this capter takes the reader to see the daily routine of the hanamachi starting with the morning lectures. Ozashiki and a few games played in ozashiki parties are under the investigating glass. There is also a section for Other Parties and Promotional Events and Festivals and Seasonal Events in Kyoto. Tokyo has it's own section. Geishas retirement is in this chapter. If one is in Kyoto and sees a geiko-maiko pair, they can be dustinguished easily.The maiko is the more colorful of the two, with many more hairpins and other ornaments; she is the one wearing the tall clogs. If still in doubt, check the obi; the maiko's hang down loose almoust to her ankles. The geiko's is bundled up in a neat square knot. For cheking how long the maiko has been a maiko, a general rule of the thumb is the more decorated kimono, the more junior she is. The okobo starps go from red to pink to purple in order of seniority. The wareshinobu, the most distinctive hairsyle, belongs to junior maiko. This chapter takes a look of the karyukai world in general, their survival stragedies, looks of future and how the geisha world is seen internationally. A wig (katsura) completes the look. The stress they place on the head causes the geisha to develop a tiny bald spot on the crown. The Maiko look on these flip-through pages is in the style of the furisode-san. Some of the images seem to me more like a Tokyo hangyoku/a henshin, than Kyoto maiko, which from the text I got the image they were supposed to be. The image text rarely/not at all inform the reader if this is a henshin, maiko or hangyoku. Nearly all maiko looking girls are titled "maiko".To save the book, there's also a good deal of real maiko and geiko images and a few pictures correctly titled henshin/hangyoku. This is a good book to play "Is this a maiko/hangyoku/furisode-san/henshin?". My overall opinion of the book is good. 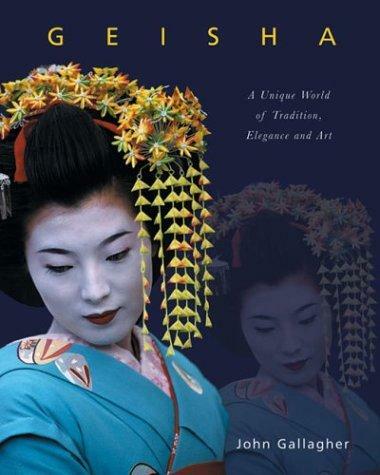 It has all the basic need to know about geisha for a starting geisha study and even thou the images at first made me doubt about the quality of the book, after reading it I come to the conclusion that the text is mostly facts, not fiction. The bibliography names a few good names (Lesley Downer, Kyoko Aihara, Hiroshi Mizobuchi, Iwasaki Mineko). The Internet recources mention The Caged Birds and ImmortalGeisha as a good place to find information. - Those who want to play "Is this a maiko/hangyoku/furisode-san/henshin?" Your instincts about this book are pretty spot-on. It's got some great info, but it also has some blatant inaccuracies. Here's a discussion about it. Thank you for the link Moonblossom-san, I did not know there had been a discussion about the book earlier (oh the search fu, where art thou? ).